Mick Jones: I was under immense pressure, so Bernie said to me, ‘Mick, why don’t you give your lawyer powers of attorney and then I can work it out with him?’… You know what I mean? I kind of felt under pressure at the time and I said ‘OK’ for that period and then he went to the other and went, ‘Look what Mick’s done, he doesn’t wanna talk to you anymore he wants you to talk to his lawyer’, and then fucked everything up; so that was what happened backstage, you know, but backstage it was always a bit chaotic, it was manipulative…. because we weren’t being told what was going on so by that time we’ve stopped talking to each other a bit – or more than a bit. We’ve stopped pretty much talking to each other because we were on our own trip so we didn’t know what we were doing, we were just like a bunch of idiots thrown into the spotlight, you know? This is an extract from The Rise and Fall of the Clash by Danny Garcia which you can purchase on this site at a discounted price (£15.99 instead of £18.99) by clicking here. 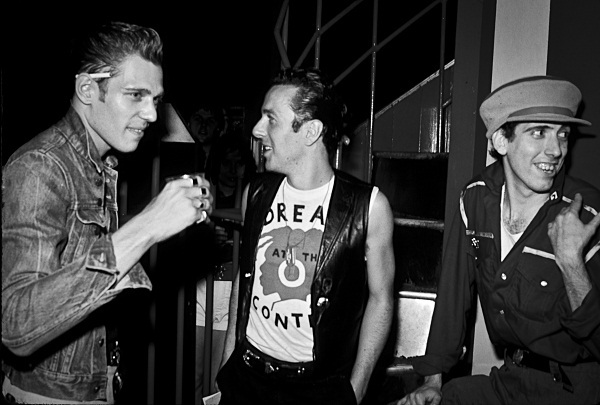 This entry was posted on November 7, 2013 by susandemuth and tagged bernie rhodes, bernie rhodes manipulative, book about the clash, clash book, danny garcia book about the clash, joe and mick fell out, Joe Strummer, Lawyer, lawyers, Mick Jones, mike laye pictures of the clash, new book about the clash, new pictures of the clash, pictures of the clash, the clash break up, the rise and fall of the clash, why did the clash split.